For a presentation about your time with the MCC. Please contact Dena Doyon or call (207) 624-6085 for more information. Update your contact information with the MCC Have you moved? Not getting the MCC newsletter in your inbox anymore? Take a minute to update your contact info with us. Join AmeriCorps Alums! If you're staying in Maine (or have moved back!) you can indicate Maine as your primary chapter. 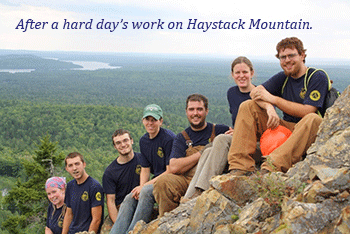 To find out about Maine AmeriCorps Alums events, visit www.americorpsalumsme.org. If you have any questions, you can also contact the Maine Chapter Leader, Kate McCarty at kate.mccarty@americorpsalums.org. Don't forget to like the MCC on Facebook! Get Job & Service Opportunities in your inbox! Natural Resources Career Center, State of Maine - View only the postings by the State of Maine Natural Resources Career Center.